Editor's note: If you would like to see these tools presented in a webinar, visit our On Demand Webinars and look for "5 Critical Tools for Your Lean Deployment." Lean, also known as “Lean Manufacturing” or “Lean Production,” focuses on maximizing customer value by removing waste and eliminating defects. Lean tools are about understanding the process, looking for waste, preventing mistakes and documenting what you did. Let’s look at five Lean tools used in process improvements, what they do, and why they’re important. Companion by Minitab can help you get started leveraging the tools of Lean and other continuous improvement methods to thrive in your business. These tools are even more powerful if you can share and collaborate with your team, so we encourage you to try Companion’s online dashboard reporting capabilities as well. 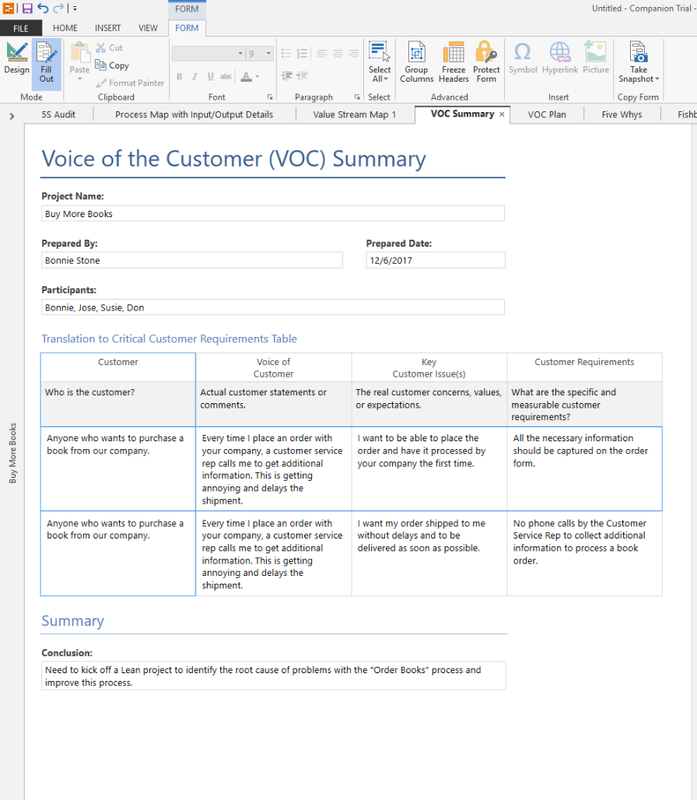 Collecting the Voice of the Customer is a critical step when implementing Lean. The VOC Summary provides a way to capture important data, so you can act on it to meet key business goals and improve customer relations. A basic tenet of Lean is to understand the customer needs and design the process to fully meet (or hopefully exceed) customer expectations. Using the VOC Summary tool will help you understand the key customer issues and convert those issues into critical customer requirements. Process flows, also known as process maps, help you to understand and communicate the activities, or steps, in a process. They also help you to see the relationship between inputs and outputs in a process, identify key decision points and uncover rework loops. Because this easy-to-visualize method allows people to clearly see a process, it is most effective to build process maps with the team working in the process. The creation of a process flow makes waste visible (bottlenecks, delays, storage, rework, etc.) and shows the best opportunities for improvement. A value stream is the collection of all activities, both value-added and non-value added, that generate a product or service required to meet customer needs. Value Stream Maps extend the usefulness of process flows by adding more data (beyond x’s and y’s), material and information flow; operating parameters; defect rates, lead times, and so on. A current state value stream map identifies waste and helps your team to envision an improved future state. Lean is about understanding why things are done the way they are. Often, things are done improperly, at the wrong time, or skipped altogether resulting in process problems. 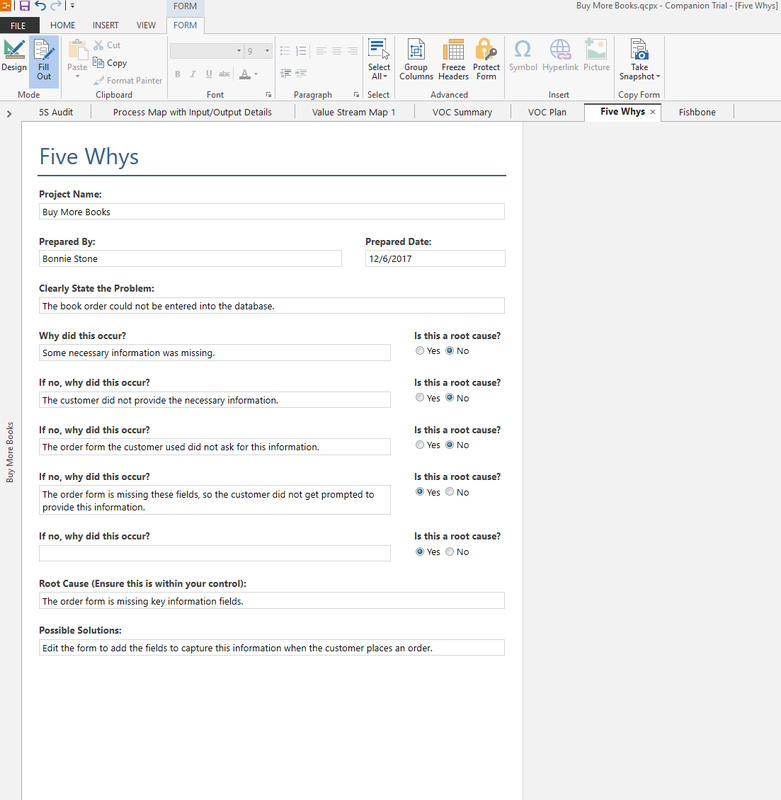 Use the Five Whys tool to determine the root cause of a problem. Repeat the question "Why?” and you can uncover the problem’s root cause, the relationships between different root causes, and identify steps to prevent the problem from happening again. The real root cause should always point to a process that does not work well or does not exist. Most of the time people do not fail; processes do. 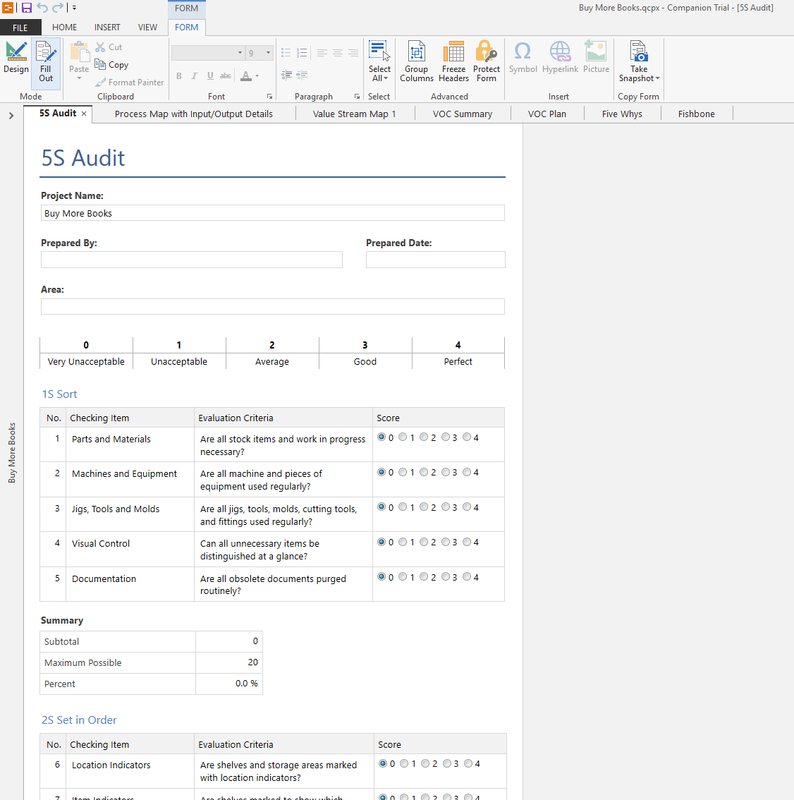 5S is a team-based set of tools that systematically and methodically organize the workplace. A clean, well-ordered workplace improves efficiency and eliminates waste. The fifth step, Sustain, is one of the hardest steps to accomplish. It’s akin to losing the weight and keeping it off. Sustaining requires maintaining the gains of process improvements on a regular basis. Without it, old habits resurface, and the workplace falls into disarray. One of the advantages of Companion’s online dashboard reporting is the visibility into everyone’s progress. Everyone can see the benefits and be encouraged to keep it up. If you enjoyed these five Lean tools, be sure to read the follow-up: 5 More Critical Lean Tools.